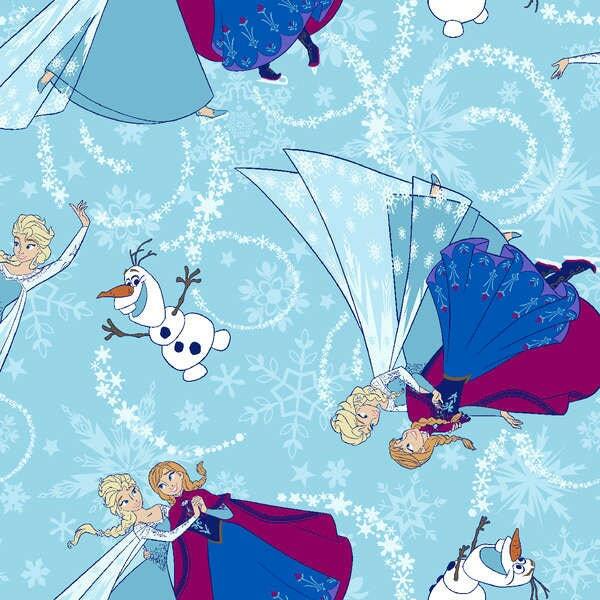 Frozen Children's Cotton Fabric from Disney Frozen from Springs Creative. Sisters skating multi colors of blue with glitter. Children's Fabric From Springs Creative Group and licensed by Disney, this cotton print fabric is perfect for quilting, apparel and home decor accents. Colors include burgundy, white, brown, orange, peach, and shades of blue. Features gold glitter accents throughout. A new addition to the childrens fabric line from Disney and Springs Creative. All fabric from The Quilted Nursery is cut directly from the bolt and is sold by the yard also in increments. Same Day Shipping Always! Fabric just as described. Wonderful fabric shop!